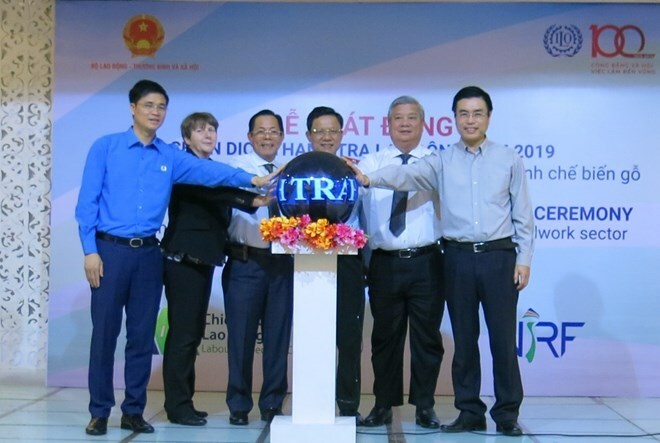 Binh Duong (VNA) – An inspection campaign in the woodwork industry was launched on March 27 to promote compliance with labour laws in the sector, which is a big foreign currency earner for Vietnam. The campaign is being conducted by the Ministry of Labour, Invalids, and Social Affairs (MoLISA), the Vietnam General Confederation of Labour, and the International Labour Organisation (ILO). Aside from inspections, the campaign will also carry out communications activities to raise awareness and provide guidance and training for firms and labourers to improve their adherence to the law. At the launch ceremony in the southern province of Binh Duong, MoLISA Chief Inspector Nguyen Tien Tung said the campaign will be carried out across 63 provinces and cities nationwide, with a particular focus on Ho Chi Minh City and nearby Binh Duong and Dong Nai provinces. He noted that labour law violations are still popular in wood processing businesses, including excessive overtime hours alongside breaches of occupational health and safety as well as labour contract regulations. The campaign will help develop a sustainable and modern wood processing and forestry industry. Vietnam aims to become one of the leading countries in terms of wood and forest product manufacturing and export in the next decade, he added. Andrea Prince, a representative of the ILO in Vietnam, said wood processing is becoming an important sector in Vietnam’s economy, with its increasing export value and high job generation. If working conditions in this industry are not ensured, its development prospects will be affected, she said. With an annual growth rate of 13 percent and export revenue of over 8 billion USD, wood processing is currently the sixth biggest foreign currency earner of the country.